The Swift is a very popular car and Maruti Suzuki has sold tens of thousands of it. It has been among the top 3 selling cars list ever since its launch and has incredible brand visibility and loyalty. Maruti Suzuki has sold over 1.8 million units of the old Swift and now, the third generation car has been launched at the 2018 Delhi Auto Expo. The new Swift has been built on the new HEARTECT platform that also underpins Baleno, Ignis and the Dzire. 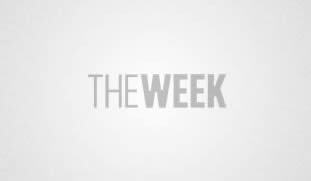 We already know that the new iteration of Swift will set many sales records as the waiting period is already into weeks, proving that the Swift hasn’t lost its popularity. But just how new is the new Swift? The first generation Swift was a peppy car; second generation Swift grew across all directions and now the third gen looks like it pushed some serious hours in the gym. The design of the new Maruti Swift is all-new but evolutionary. That Swift hangover is still there and that is how we like it. Unlike the previous generation Swift and Dzire, Maruti Suzuki has done a good job by giving the Swift a different grille and front bumper to differentiate the twins. Straight away, you see the absence of chrome accents with the all-black front grille and projector headlamps with DRLs (similar to the Dzire) showing off a sportier look. To the side, the two-tone alloy wheels and the floating roof take your attention. The rear door handles are mounted on the C-pillar and will make the Swift unique in its segment. Come to the rear, the design is neat and simple with only the LED combination tail lamp acting as an attraction. Overall, the exterior of the new Swift is a very likeable one. The car has grown 40 mm wider and there’s 20 mm of more wheelbase, opening up space inside. Inside, the cabin is similar to the new Dzire but gets all black treatment over the black-biege of the Dzire. 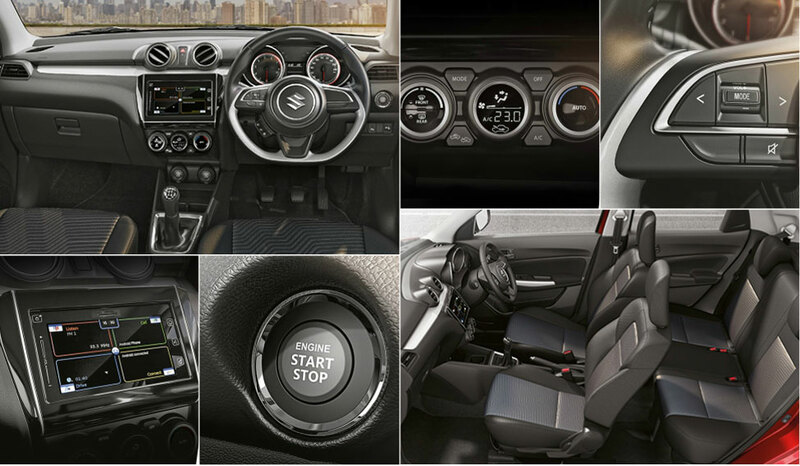 The rectangular vents are replaced by circular ones and the climate control gets rotary dials in the Swift. The twin-pod instrument cluster gets red highlights and there’s a flat bottomed steering wheel to support the sportier character. The front seats are very comfortable as always but the cushioning could have been a tad firmer. Things at the rear have improved thanks to the growth in dimensions and better packaging. Maruti Suzuki is also claiming 24 mm more headroom and we would like to think so too. The pillar mounted outside door handles further shrinks the already small windows. In the Z+ variants, you get a 7.0-inch Smart Play infotainment system that comes integrated with Apple CarPlay, Android Auto, Mirror Link compatibility and parking camera. Coming to the engines, the 1.2-litre K12 petrol engine and the Fiat-sourced 1.3-litre Multijet diesel engine have remained with the Swift from the first generation. Some would think can’t Maruti Suzuki give a new engine line up and it might happen soon but just not now. And there’s no wrong in it as the engines are proven and still have a lot to offer especially with the new platform. The car weighs 85 kg less in its new avatar and that has made the engines peppier. 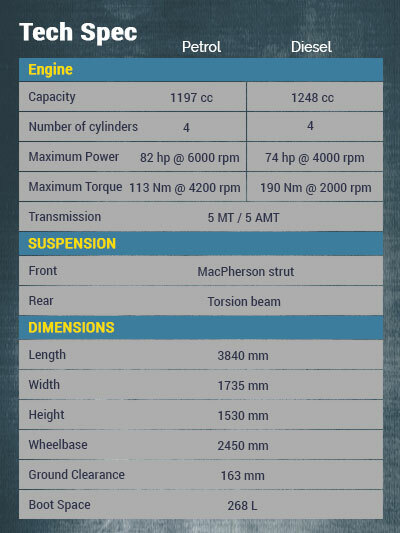 Both the engines are available with manual and AMT options. The AMT has come a long way and has improved a lot but the limitations of the technology still leaves a lot to desire for. Power and torque outputs remain the same. The 1.2-litre is still a rev happy unit as always and lunges off the line immediately, though you have to work hard for mid-range response. The 5-speed manual transmission slots the gears perfectly and doesn’t waste time in changing gears. The 5-speed AMT on the other hand does well in low speeds but push them much and they run out of breath. The 1.3-litre diesel unit, with its 74 hp and 190 Nm, is a fun-to-work-with engine once you cross the turbo lag that is typical of the Multijet unit. A lighter clutch and a smooth working 5-speed manual gearbox offer the best combination. Both the engines have better fuel efficiency with the diesel unit offering a segment-best of 28.4 km/l. One of the main highlights of the HEARTECT platform in the Swift is the ride quality and handling. The use of high tensile steel that has made the chassis stiffer and lighter has aided in better driving dynamics. The ride is on the stiffer side but nothing to be worried about except the feedback from the steering wheel, which is just not enough. Sure, the Swift is still a fun car to drive around but first generation’s involvement is still a miss. The new Maruti Suzuki Swift has done well to carry on the legacy of the brand. 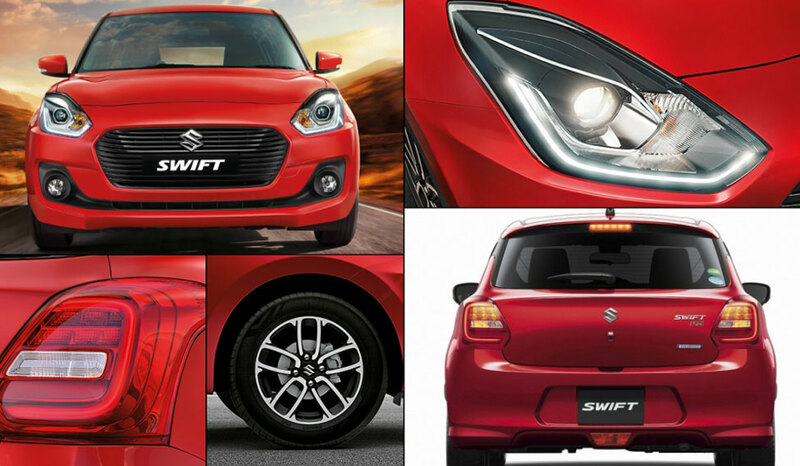 Great looks, good ride quality and better features make the Swift an amazing package. But Maruti could have offered many of those defining features from the mid variants. Some of the features are available in the Z+ variants only, which we think is a missed opportunity.